Creating a digital collage with the iPad app iColorama is a lot of fun and the options are endless. 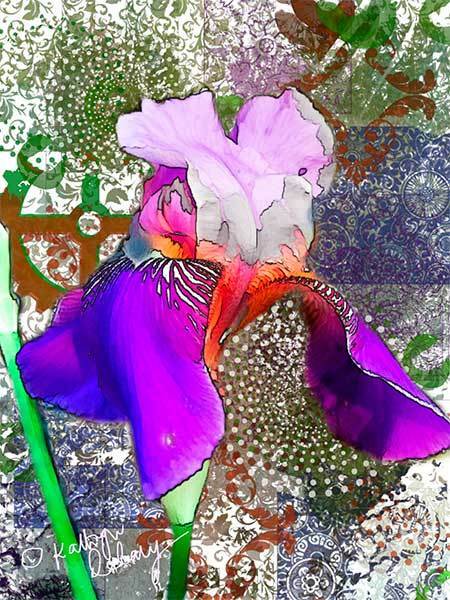 There is a new kid on the block when it comes to creative art/photography apps for the iPad and iPhone. The developer, Terisita Alonso Garit is incredibly hands on and very involved with her online community. Creatives could not ask for a more brilliant relationship. Teresita is continually interacting with the members on the Facebook group page and Instagram members. The art that is being created with this app is simply stunning. 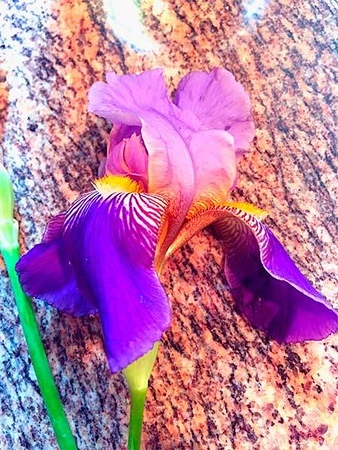 Using my photo of any Iris which I photographed on my granite countertop. Not a very good photo as a result. I knew that I could do something really different in terms of building up a unique background while retaining and improving the image of the iris flower. I opened the image above in the iColorama app on my iPad. I masked out the iris to preserve it. I had created an image of hearts and text collage using iColorama a while ago and decided to see what happened when I dropped that into the background using the brushes options. Once that was in place I inverted the mask so that the background was now protected, and played around a bit with the way the iris looked. I was quite happy with this result, but not totally in love. Don’t get me wrong I love this one for all the soft lines I got. 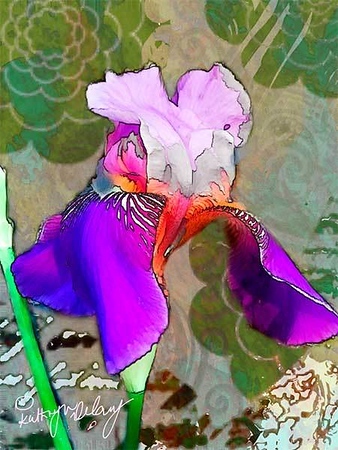 I reintroduced my mask of the iris to the iColorama canvas – I can save the mask to my camera roll and reuse until I am tired of it. I decided to try a different background from scratch rather use one I had already created. I went to town playing with the background, again using the different brush options and brush shapes. The end result I think is a winner with loads of interest, layers and energy. Let me know what you like best of these digital collages in the comments below.